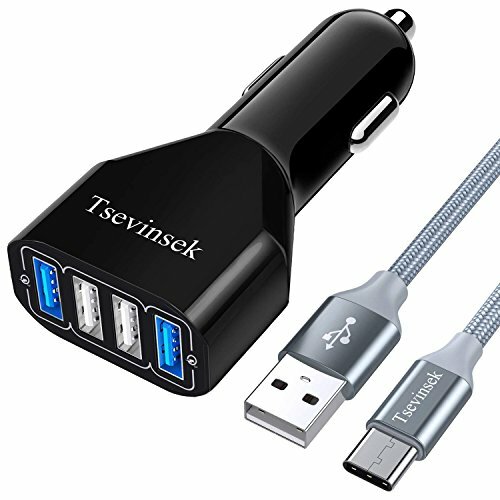 Tsevinsek car charger adapter features the advanced Qualcomm Quick Charge 3.0 Technology which is 4 times faster than a standard car charger. Get your cell phone quickly recharged in a short drive to work. No long have to keep it plugged all night while sleeping. Move over, this car charger has dual USB ports for Quick Charge 3.0. It is able to fast charge two compatible devices simultaneously. Apart from the two Quick Charge USB ports, this charger adapter is also built with dual 5V2.4A ports for non-quick-charge devices. It can charge multiple devices at the same time and provide optimal charging efficiency to keep you and your devices safe. This kit includes a nylon-braided USB Type C cable. Save your money on an exact cable. The cable supports safe high-speed charging at 5V/2.4A and fast data transfer at 480Mbps (transfers over 20 songs per second). If you have any questions about this product by Tsevinsek, contact us by completing and submitting the form below. If you are looking for a specif part number, please include it with your message.